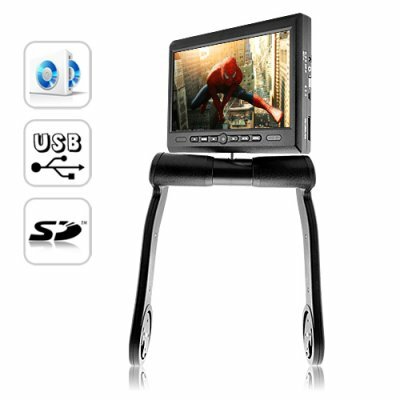 Successfully Added 8.5 Inch TFT LCD Armrest Monitor With Built In DVD Player - Black to your Shopping Cart. An extra large screen LCD armrest with built in DVD and SD card / USB flash drive media player for those want a first class in-car entertainment experience without all the installation hassles or spending a lot of money! There are lots of ways to upgrade your in-car entertainment experience. You can go with a car DVD player, a portable GPS and media navigator, a DVD headrest or this amazing 8.5 Inch TFT LCD Armrest Monitor With Built In DVD Player! So why this product over the others? In terms of DVD playback for your car, it's the easiest to install. Price-wise, it's one of the most affordable options while providing the best bang for your buck multimedia awesomeness! This incredible 8.5 Inch TFT LCD Armrest Monitor with built in DVD player connects to your car battery or better yet plugs into your cigarette lighter slot. Once powered it plays all types of multimedia disks such as DVD/VCD/CD (audio or MP3) in crystal 8.5 inch LCD splendor! What's more, insert a USB flash drive or SD memory card into the player, and experience movies, songs, or even view pictures in the following media formats: DIVX 5, AVI, MPEG4, DAT, VOB, MPEG 1/2, 3GP, MP3, WMA, and JPG. This 8.5 Inch TFT LCD Armrest Monitor With Built In DVD Player also has built-in speakers, but you can just as easily use the FM transmitter function to output audio to your FM radio and experience rich stereo sound through your car speakers. Don't worry about installation though. The leg stand forks by which the unit is attached to your car's armrest can be adjusted to fit widths from 160 mm ~ 230 mm. Now you won't have to hear another "are we there yet?" on your next family trip with this great LCD monitor with DVD player from the one and only, often imitated impossible to be duplicated, leader in direct from China wholesale electronics - Chinavasion. The leg stand forks can be pushed in or pulled out to fit many different armrest widths from 160 mm ~ 230 mm. Can I buy this even if I don't have kids? This is a great DVD player/LCD monitor combo if you're a taxi driver and you want to offer in-car entertainment for your passengers. It's also great for your co-workers during the morning and evening carpool commute. They can watch movies and won't have to talk about work all the time which is inevitably what colleagues do when they get together.